Most people that know of Grangegorman are aware of the boundary wall. 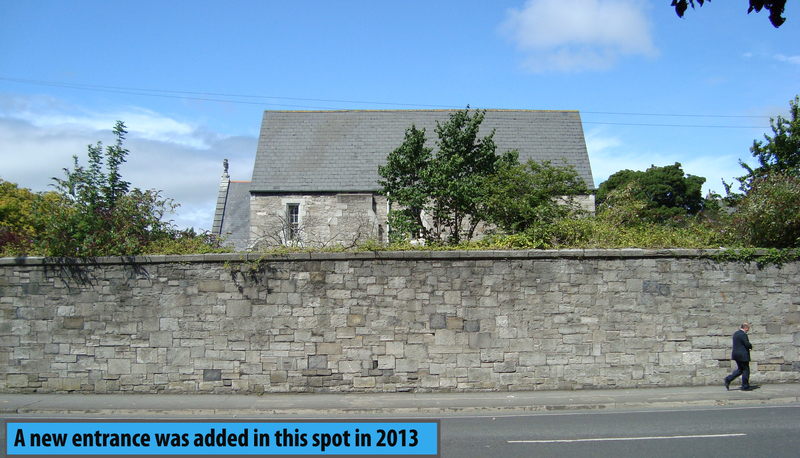 It extends around the periphery of the site; covering both sides of Grangegorman Lower and is 12ft high in places. What you may not be aware of is that the wall, like many of the buildings inside its domain, is a protected structure. It can be viewed as one of the reasons Grangegorman had become shut off from the rest of Dublin City, a physical barrier dividing the site and its surrounding communities. With its solid, grey façade and one primary access (until 2013), it’s hardly surprising that the wall is perceived as imposing, unwelcoming, and as a symbolic feature of hidden histories. But perhaps there is a second way to view the wall. What if we also viewed it as we do our home boundaries? Typically, they also have walls (or hedges) surrounding the property. Granted, not usually as high but maybe constructed for similar reasons. Can the Grangegorman wall not also be defined by these three characteristics? Two sides to every story: two sides to Grangegorman’s boundary wall. Do we not all aim to establish a safe space behind the walls of our houses? By the same measure in certain unhappy circumstances, those same walls can become restrictive, trapping us between them. Metaphorically, we build walls to prevent unwanted intrusions into our private lives. The Grangegorman wall is no different from this. It closed-off and divided the geographical area but it also provided privacy and protection for those inside its walls. 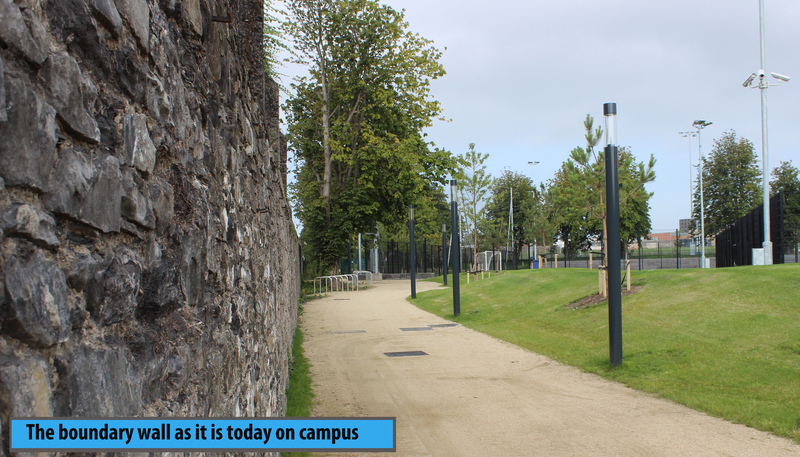 Built in phases from the early 19th century onwards, the Grangegorman wall provided the boundary for the then innovative approach to mental health treatment and protection to patients of the psychiatric hospital. Originally named the Richmond Asylum, the oldest building at Grangegorman was the first dedicated public psychiatric hospital in Ireland. It was built as a result of the overcrowding of people with mental health issues in the adjacent House of Industry on North Brunswick Street. It was decided that a purpose built facility for these vulnerable people would get them off the streets and kept safe and away from the public. The height of the wall built around the Grangegorman site remains a clear indication of this way of thinking. Modern mental healthcare has moved away from the hidden away approach towards the de-stigmatisation of mental health issues and the reintegration of service users into the community. The redevelopment of Grangegorman is highly representative of this. At the height of the psychiatric hospital here there were over 2,000 patients confined within the walls. The replacement mental health facility – the Phoenix Care Centre – (opened in 2013) has a maximum of 54 beds, many of which are used for temporary stays. In opening up of the Grangegorman site, the Masterplan principle of connectivity is becoming a reality. Both physically and metaphorically, the walls around Grangegorman are coming down. 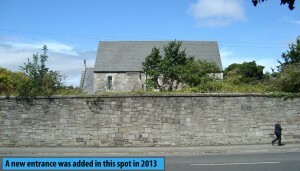 As a protected structure, the Grangegorman wall has to be conserved as far as possible. The Masterplan allows for strategic new openings in the wall for accessibility, and symbolic of modern mental healthcare, the reintegration of the site into the surrounding communities. The shift to a more positive view of the Grangegorman site has been strengthened by this tangible partial removal of the boundary wall. Famous uses of other boundary walls such as the Berlin Wall also highlight them as obstacles, dividers, negative, in public perception. On the other hand, walls also offer protection and shelter from exterior dangers. For whatever reason, the first instinct is to perceive a boundary wall, and perhaps particularly Grangegorman’s wall, in only a negative light. However, today the Grangegorman wall, for all its towering grey limestone façade, is also a veritable hub of biodiversity and helps the site to maintain a pedestrian/cyclist haven amidst the busy city traffic.